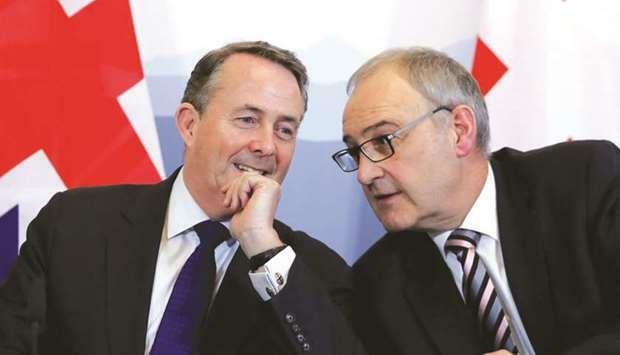 (MENAFN - Gulf Times) Britain's economic slowdown should not be blamed entirely on Brexit, British Trade Minister Liam Fox said yesterday after data showed the economy last year grew at its slowest since 2012. 'Clearly there are those who believe that Brexit is the only economic factor applying to the UK economy. I think you'll find that the predicted slowdown in a number of European economies is not disconnected from the slowdown, for example, in China, Fox told a news conference in the Swiss capital. 'The idea that Brexit is the only factor affecting the global economy is just to miss the point, he said. 'The chances of having a second referendum are as close to nil as I could imagine, he said. He said the ideas put forward by Corbyn were 'not workable, because it was impossible to subscribe to his proposal to have a customs union with the EU while also influencing EU policy. 'To pretend that you could do so is a dangerous delusion, Fox said. About 12% of Britain's trade was currently covered by EU free trade deals, and Switzerland accounted for about a fifth of that, he said. Fox had previously said Britain would be able to roll over all of the EU's current trade deals, but so far he has only concluded agreements with Chile, the Faroe Islands and Switzerland. 'We are confident that we will be able to maintain a very high proportion of that continuity of trade. Of course it's always dependent on other partners wanting to retain that continuity too.